Jen “Slingin’ Gritz” Stern (history ’97), center, began skating with the NRV Rollergirls in 2008 and now competes with Collision Men’s Derby in North Carolina. At Virginia Tech, students learn that individuals can come together to form a whole that is stronger than its parts. Beyond the classroom, many Hokies put that knowledge to work in their professional lives, and through participation in team sports that continue well past graduation. Four Virginia Tech alumni have seen that team-oriented mindset play out at the highest levels of one of America’s most hard-hitting amateur sports: roller derby. Since roller derby arrived in western Virginia in 2007, Virginia Tech students and alumni have skated with the New River Valley (NRV) Rollergirls of Blacksburg, the Star City Roller Girls of Roanoke, Virginia, or more recently with the combined team known as the Valleys All-Stars. Some players grew their skills through a once-popular campus Roller Derby Club, and a few have continued their participation through leagues across the country. Roller derby began in the 1930s as a skating marathon before evolving into a full-contact sport. It was popular through the mid-20th century as sports entertainment, with theatrical elements and clearly defined heroes and villains. The sport re-emerged in the early 2000s, and quickly grew into a popular amateur sport around the world. Tori Elmore (mechanical engineering ’09) skates with Houston Roller Derby as Arrak-Kiss. 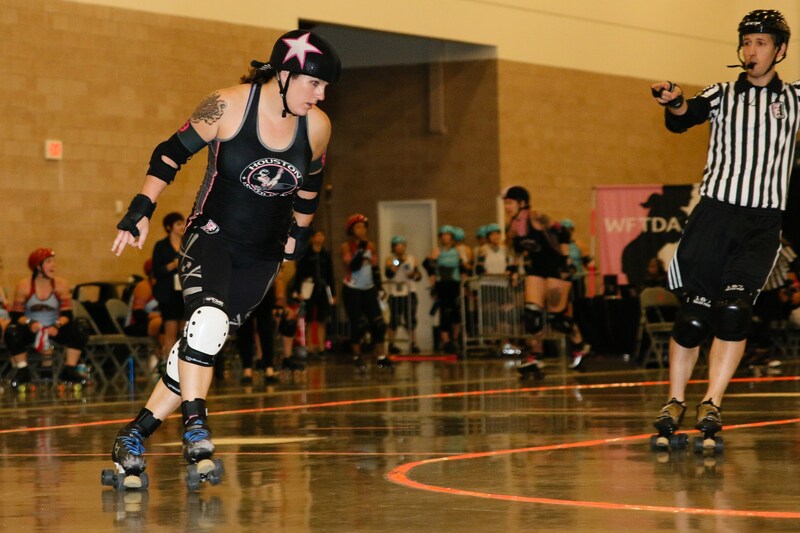 Except for pun- and pop culture-filled pseudonyms, contemporary roller derby has shed most of its theatrical elements and instead focuses on skating, teamwork, and tactical battles. Played in “jams” that last up to 2 minutes, the modern sport features two teams on quad roller skates who play offense and defense at the same time. 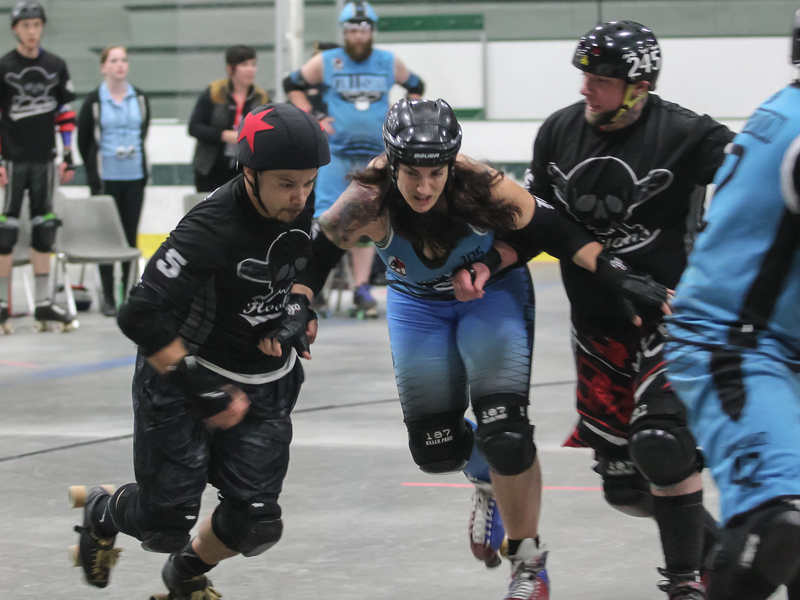 Each team consists of four blockers who create opportunities for their “jammer” to score points by passing skaters, while simultaneously blocking the opposing jammer. Agility, speed and skill culminate into a competitive, empowering environment, and participation connects players across the globe. Some Tech alumni have gone on to compete in the Women’s Flat Track Derby Association’s (WFTDA) “Big Five” tournaments, which decide the association’s champion each year. One has found her place among the pioneering women who now play men’s derby. All have overcome obstacles and continuously adapt to a sport that is still evolving, while pursuing careers in fields that range from architecture, mechanical engineering and insurance, to auto manufacturing safety. Stephanie Beeman (M.S. 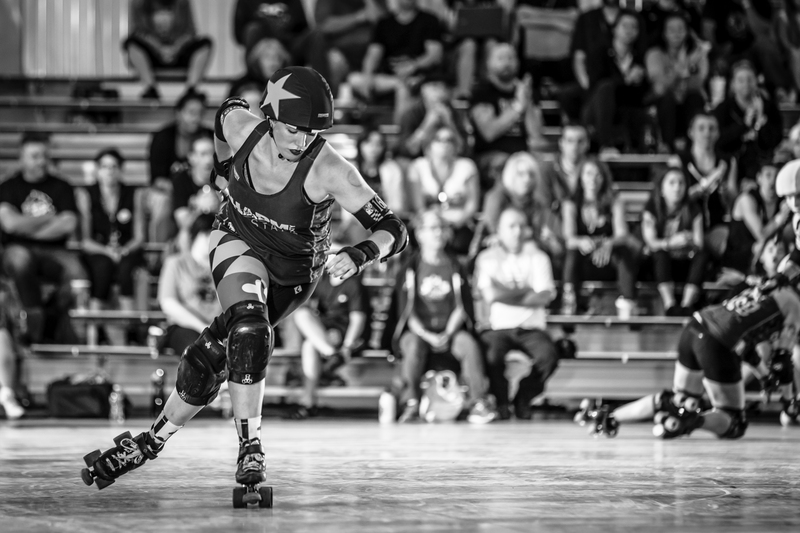 biomedical engineering ’11, Ph.D. ’15), who skates under the name Bettie Lockdown, joined the NRV Rollergirls in 2010, during her first year as a Virginia Tech graduate student. Roller derby functions as a do-it-yourself amateur sport, organized by skaters, for skaters. Beeman took an active role in the workings of the league, which was organized as a 501(c)(3) nonprofit organization. As she pursued her degrees, she also learned about how to run an organization and put on sporting events. Kacey Huntington (M.Arch. ’10) skated with Baltimore’s Charm City Roller Girls as I.M. Pain. 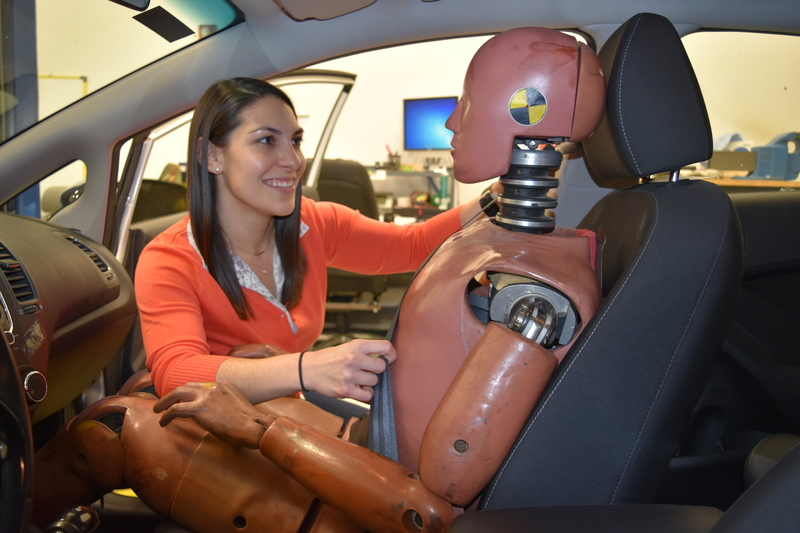 This year Beeman moved to Ann Arbor, Michigan, to become a regulatory engineer at the Hyundai Kia America Technical Center Inc., a job that entails overseeing company compliance with state and federal regulations. She also transferred to the Ann Arbor Derby Dimes, ranked No. 30 in the world. The Dimes skated in a qualifying tournament in Seattle in September, but did not move on to championships. 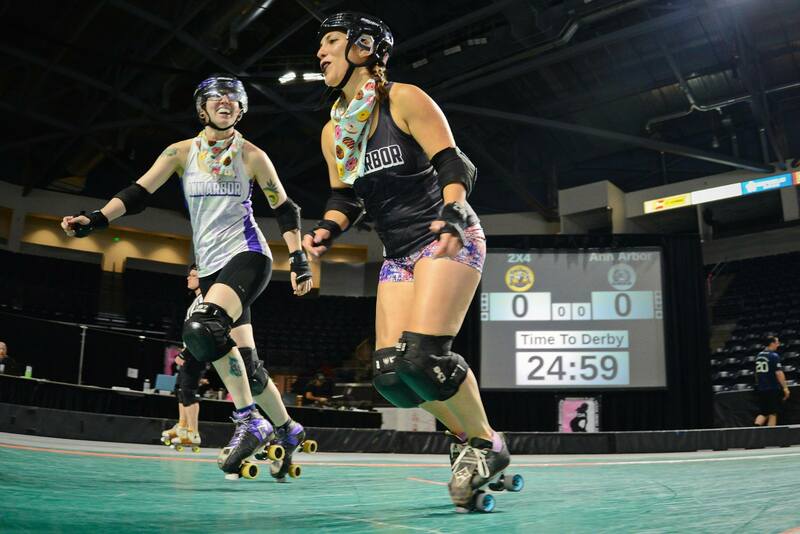 Tori Elmore (mechanical engineering ’09), who skates as Arrak-Kiss—a reference to Frank Herbert’s epic sci-fi series “Dune”—is another former member of the NRV Rollergirls who achieved new success with a transfer to a new league. Elmore first skated with NRV as a referee before becoming a competitor. Last year, she moved to Houston to work as a mechanical equipment reliability engineer for bio-pharmaceutical manufacturer Syngenta. The first time Elmore attended a Houston Roller Derby practice, she was amazed by how much bigger it was than an NRV practice, both in terms of venue and the number of skaters. Leveling up forced her to reinvent her game. She studied footage on Youtube, analyzing how successful skaters used their bodies, including how they turned their shoulders and where they focused their vision. Stephanie Beeman (M.S. biomedical engineering ’11, Ph.D. ’15), right, skates with the Ann Arbor Derby Dimes under the name Bettie Lockdown. Derby has provided a supportive community for Elmore, who transitioned from male to female after first joining NRV in 2009. She found people there who supported her through the process and continue to do so today. “As I started learning more about myself and who I really am, it was definitely a community open to people making sweeping life changes and letting people explore themselves and not just stick to convention,” Elmore said. The Virginia Tech alumna who probably has skated in more WFTDA tournaments than any other is Kacey Huntington (M.Arch. ’10), who skates as I.M. Pain, a name that pays tribute to famed architect I.M. Pei. She applied to Virginia Tech as her “reach” school and was excited to get in. A competitive speed skater since age 5, both as an amateur and professional, she was recruited by the NRV Rollergirls in 2009. When Huntington moved to Maryland in 2010 to pursue her professional goals—first with archtictural engineering firm Nika Architects and Engineers in Rockville, and later with architecture, landscape architecture, planning, and interior design firm Hord Coplan Macht in Baltimore.she tried out with the Charm City Roller Girls, a perennially competitive team. She quickly became a primary jammer. Since joining the team, Huntington has competed in six playoffs and three championship tournaments. In 2013, she separated a shoulder and attended as a bench coach. In 2015, she had a broken ankle and missed the tournament. In one 2012 game during championships, Huntington scored a notable 34-point jam against Denver. Stephanie Beeman at her day job as a regulatory engineer at the Hyundai Kia America Technical Center Inc..
With the exception of a February 2017 state team tournament, Huntington retired from competitive play after the 2016 season. She remains involved on Charm City committees and as a member of the LLC. Jen “Slingin’ Gritz” Stern (history ’97), meanwhile, is blazing a trail that’s entirely hers. For Stern, the decision to attend Virginia Tech was a simple one. . Her grandfather, E. George Stern, pioneered wood sciences at the university during his four-decade tenure as a professor. In 1997, the Stern Fastener and Pallet Research Laboratory at the Thomas M. Brooks Forest Products Center on campus was named for him.While at the university,Jen Stern was a member of the Marching Virginians. After graduating, she married and started a family. In 2008, she found the NRV Rollergirls. From 2010 to 2015, she expanded on her identity as a skater, spending some weekends with independent wrestling alliances in Virginia and North Carolina. Stern wrestled as “Derby Girl Jennifer Blaze” to promote NRV Rollergirl events. Sometimes, her derby helmet would play into match finishes; she’d either use the object to knock her opponents out behind the referee’s back, or it would be used against her. In 2013, Stern moved to Clayton, North Carolina, near Raleigh, where she joined up with the Carolina Roller Girls. In August of 2015, she started playing with a men’s league, Collision Men’s Derby. “I had joked about wanting to play with men,” Stern said. “I did feel like my size and physical style of play were more fitting for the men’s game.” Since another mid-Atlantic men’s team, Harm City Havoc of Baltimore, was about to get a woman on the team, she decided to try skating with a men’s team as well. The stylistic shift challenged her in a way that enthralled her and forced her to evolve her game. Today, more women have joined men’s leagues thanks to pioneers like Stern. Back in women’s derby, Virginia Tech alumni continue to make a markas well—competing at the highest levels in the world.